We have another great tutorial available for our readers today. If you want to learn how to mix different vectors, brushes and stocking image in Adobe Photoshop CS5 to create a stunning photomontage, then this tutorial is for you. Layered PSD file included. Let’s get started! Start working by creating a new document (Ctrl+N) in Adobe Photoshop CS5 with the size 800px by 1024px (RGB color mode) at a resolution of 72 pixels/inch. 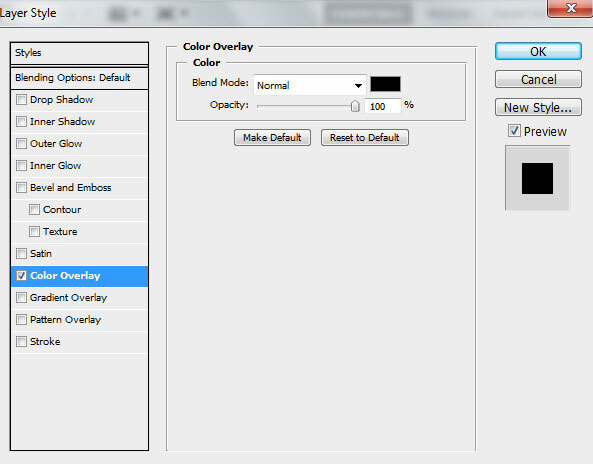 Use the Paint Bucket Tool (G) to fill with #05A4B9 color the new background layer. Find a stock photo with a model represented on it, I used this photo from deviantart. I would like to thank the author of this photo, or if you prefer, you can substitute similar image of your own. Remove the background using your favorite tools like Pen Tool (P), Magic Wand Tool (W), Magnetic Lasso (L) or even a simple Filter>Extract and insert it on a new layer in our main document. Click on Add a layer style icon from bottom part of the Layers panel and select Bevel and Emboss. 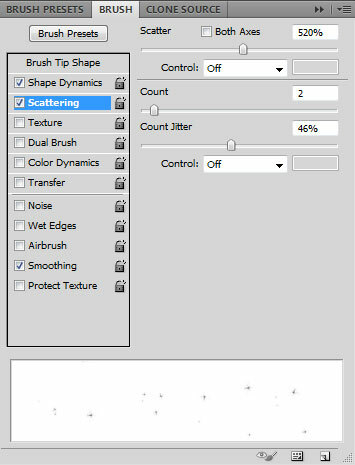 Create a new layer and select the Soft Round brush. Use this brush to paint the canvas us shown with #143648 color (set brush’s Opacity to 20% in Options bar). The layer must be situated lower than the girl’s layer. Create one more new layer and use here also the Soft Round brush mentioned above to continue painting the canvas. The brush’s color is #143648 (Opacity – 10%). This layer will be situated also lower than the girl’s layer. Create a new layer and fill it with black color using the Paint Bucket Tool (G). Then apply on the layer the next filter: Filter > Render > Clouds. The layer needs to be placed under the model’s one. Next we need to select the Free Transform (Ctrl+T) command and resize the layer on the bottom part to create a kind of flatness. Insert the mask on the layer by choosing Add layer mask on the bottom part of the Layers panel and choose the Soft Round brush of black color (set Opacity to 15% in Options bar). Paint in the mask using this brush to hide the layer as shown. 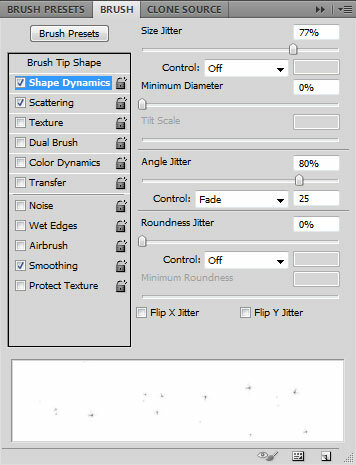 Create a new layer again and apply on it the Soft Round brush mentioned on the previous example. Use this brush to paint the canvas as shown. The brush’s color is #006BA3 (Opacity – 20%). Place the layer under the model’s one. On the next new layer we have to use the same Soft Round brush of white color (Opacity – 20%) to add a white spot behind the model. Set the Blending mode for this layer to Hard Mix. Place the layer lower than the primary layer with the model. Choose after that the Free Transform (Ctrl+T) command, select Warp option in Options bar and warp the layer to represent the model’s shadow. Place the layer under the original model’s layer. Paint in the mask using this brush to hide the shadow as shown. 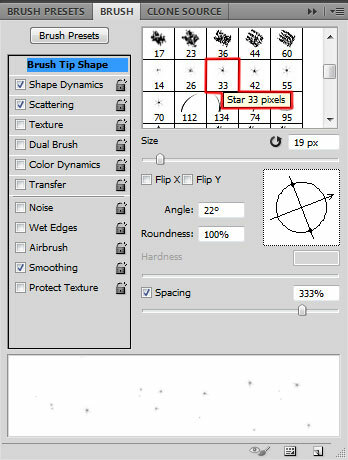 Select Star 33 pixels brush and customize the brush in Brushes panel (F5), select the Brush Tip Shape. 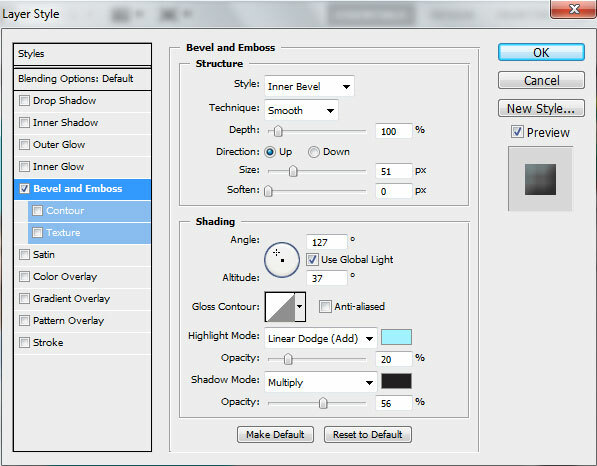 Click and drag any of the sliders to change the size, angle and the brush spacing as show. The Preview window displays the changed brushstroke. 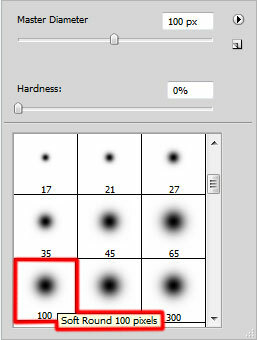 Create a new layer and paint with brush of white color to represent many small dots behind the model.